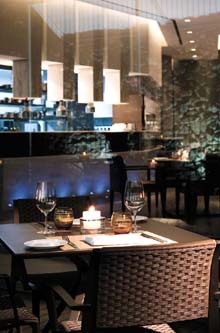 The Westin Chosun successfully launched its grand opening of the new Gramercy Kitchen on October 13th, 2006. Come and experience a fabulous evening at our trendy and sophisticated Bistro! Ideally located in the thriving Shisadong and Apgujeong area, which is famous for international gourmets and latest fashion trends, the stylish Bistro is a fabulous spot for the young generation, business persons, and foreign visitors. Along with captivating artworks by Arthur Duff, the sleek, elegant interior was designed by the famous Italian Architect Guido Stefanoni, whose previous work also included Frette Flagship store in Korea, Boon the Shop, and vecchia e nuovo Cheongdam. Among the exceptional decor, the majestic high ceiling is an impressive sight to behold. The Gramercy Kitchen is a contemporary, multi-purpose cultural space that provides the perfect setting and atmosphere for casual gatherings, romantic dinners or business meetings. The second floor also has ample room for private parties and small-scale cultural events. The extensive menu offers an incredible variety of delicious, well-being dishes and sublime desserts. Enjoy scrumptious salads, tasty Italian pizzas, fresh seafood, and tender and juicy meats such as Tenderloin Steak with Morel & Green Peppercorn Sauce, and Special Pork Loin with Wild Fruit Chutney and Port Wine Sauce. You can also watch your food being prepared from the large open kitchen. Whether you linger over a glass of wine or cocktail at the classic wine bar, or bask in the cool evening breeze while you dine on the terrace, your evening will be pure pleasure at the Gramercy Kitchen. And as the time for last order is 10:30p.m., customers can also stop by to enjoy a late night supper. For further details or inquiries about the news please cpntact Ms. Ji-Su Jung (317-0228).